And we're so happy to see him! Photos are in the slide show on this page. Be sure to check for any recent updates in the Quick Information box on the right. "These past two years have been awesome. Someone once said, “whoever said these were the best two years didn’t work very hard,” and there’s some sick humor in that. “The best two years” doesn’t mean that your life will be easy for two years, or that it will be two years of fun. I think it means the most rewarding. You learn to work, to lead, to follow, to learn, to study, to work and interact with people, to love, to motivate… pretty much everything. And then you can see the fruits: the people you loved and helped, the miracles, your personal growth, and it’s all worth it." 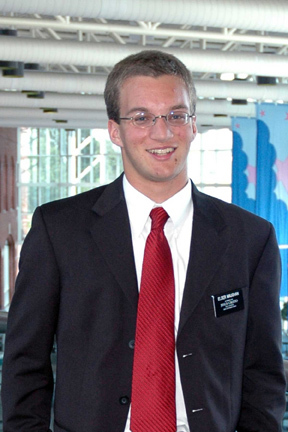 On July 5, 2006, Eric entered the Missionary Training Center in Sao Paulo, Brazil, where he will continue his preparations to serve a two-year mission for The Church of Jesus Christ of Latter-day Saints to the people in the Brazil, Brasilia mission. He is SO excited to begin his missionary service and is having a great experience in the CTM , as it is called. Since letters will be his only real contact with us during his mission, we thought it would be fun to develop this website to share his mission experiences and photos with other family members and friends.